I’m not sure if there’s a term for fans of the works of Franz Kafka (Kafkaites? Kafkers?) but if there is one, I would proudly bear the label. In fact, I have an unusually large collection of books by and about Kafka, so a collection of ‘selected prose’ such as this is generally not new to me, but I welcome the opportunity … or rather, the excuse … to give these works another read. There are many selected gems in this collection, including one of my favorite Kafka stories. I first read “The Hunger Artist” when I was in high school and it had a profound impact on me – both the ideas in the story, and the idea that a story could be conceived about this. Though I’ve read it a few times since high school, I was very glad to read it again. Though I have “Josephine, Our Meistersinger, or the Music of Mice” in another collection (titled slightly differently), I didn’t remember this, but it stands out now as one of my favorites of this collection. I have a curious creature, half cat, half lamb. A bequest from my father’s estate, it only really developed in my care, before it was much more lamb than cat. But now it’s half and half. Head and claws come from the cat, size and stature from the lamb; both bequeathed the glint and wildness in its eyes, the soft and snug coat of fur, the manner of its movements no less leaping than skulking. In sunshine on the windowsill it curls up and purrs, out in the meadow it runs around like crazy and you can hardly catch it. It flees from cats and tries to assault sheep. The roof gutter is its favorite runway in the moonlight. It can’t meow and is terrified of rats. It can lie in wait for hours beside the chicken stall, but never took advantage of an opportunity to pounce. If you think you know Franz Kafka, but all you really know is the basic story-line of “Metamorphosis” or perhaps the futility of The Trial, then I would encourage you to check out these short prose pieces. If you don’t know Kafka, then this is a great way to see the creative mind at work and play. Looking for a good book? 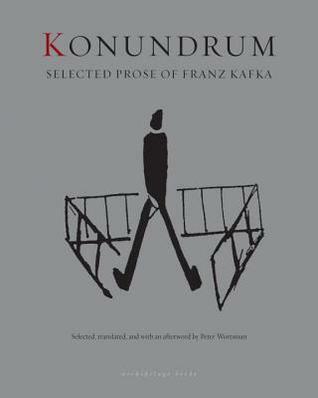 Konundrum: Selected Prose of Franz Kafka is a welcomed collection of some of Kafka’s short works. It’s high time we introduce this classic author to a new generation, and this collection could just do the trick.